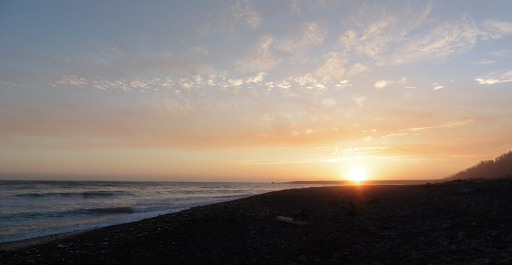 Last night, the group all drove from various places to meet at Usal Beach, the southern terminus of the Lost Coast Trail. There are a lot of logistics for this short of a trail, but it’s said to be one of the best trails in the country. The group I’m referring to is myself, Rockin, Rockin’s husband Dan, LoveNote, and Drop-N-Roll. The LCT is about 56mi long and is usually done southbound with the wind at the hiker’s back. 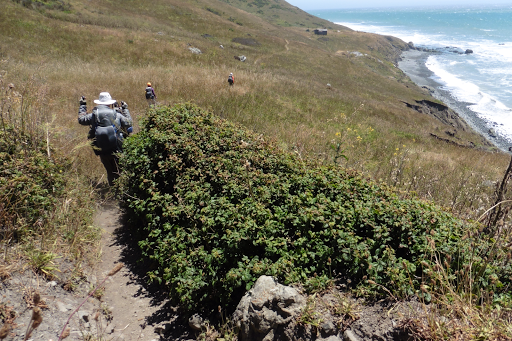 Most people hike the northern beached half of the trail from Mattole Beach to Shelter Cove. 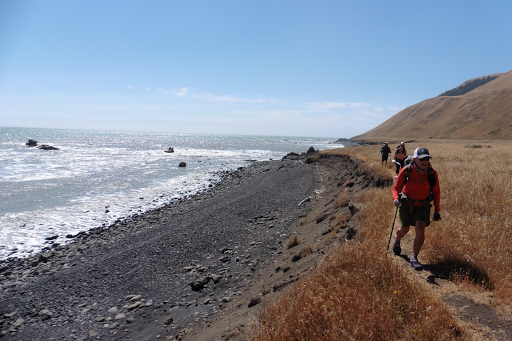 The lesser hiked southern half from Shelter Cove to Usal Beach, is off the beach and on a ridge with a lot of ups and downs. Both sections can be done in one trip with a ~3mi road walk connecting the two in the middle. The northern half requires a bear canister. Since it is a point to point hike, a shuttle is needed. The companies that shuttle charge a lot (over $300) for the ~4hr drive from one end to the other. 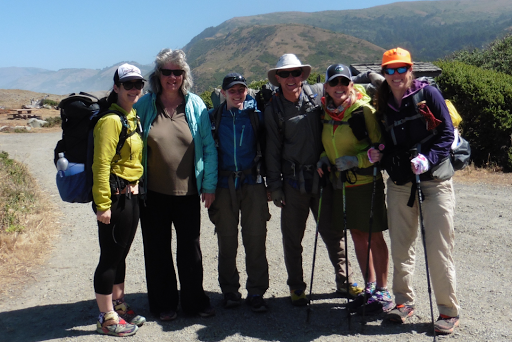 We were extremely fortunate to have someone available to shuttle us up to Mattole and that person is Kathleen. When I hiked the CDT, I met Kathleen. She is the mother of a fellow hiker, Dain, who hiked the CDT the year I did. She was a wonderful trail angel for all the hikers around Dain and we got to spend a good deal of time together through Montana. Kathleen is retired and lives in Northern California. We’ve kept in touch, and when I mentioned that we needed a shuttle for the LCT, she had no problem helping out. We all met at Usal beach yesterday had a nice CDT reunion. These people are part of my hiker family, so it’s great that so many of us were able to make this trip. Last night, it was great to kick off the reunion, relax at camp, visit the beach, have hot dogs over a campfire, and sleep in our cars. 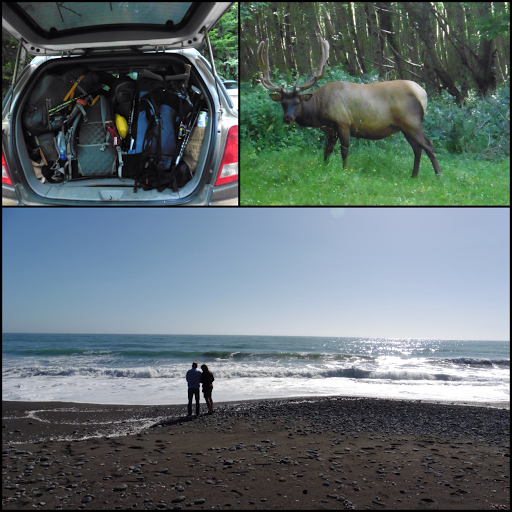 We even saw a bull elk in camp. 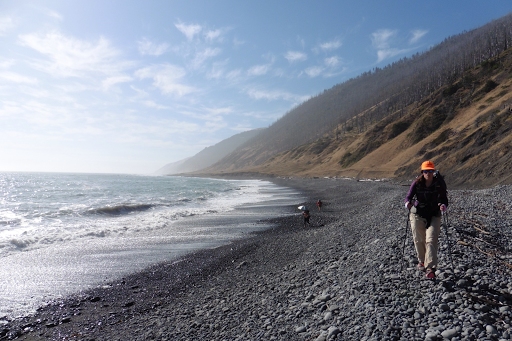 We packed up early this morning and all squeezed into Kathleen’s SUV to do the loooong car ride to Mattole Beach. One sentimental note that I love. Some of you may remember that LoveNote had an arm full of bracelets on the CDT Each of them were given to her by a different friend or family member. On the way to the trail, I made one for her out of my sewing kits thread in my pack. It was the CDT colors of black, white, and blue. 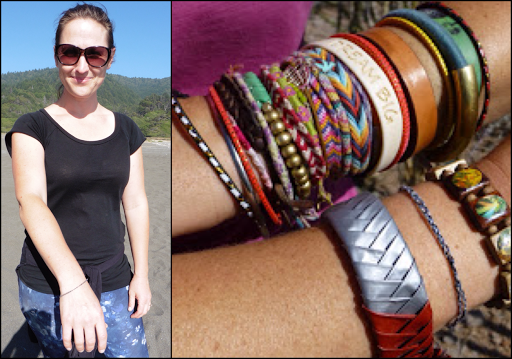 LoveNote still wears one bracelet out of all those bracelets…and it’s the one I made her, awww! Lovin’ LoveNote! 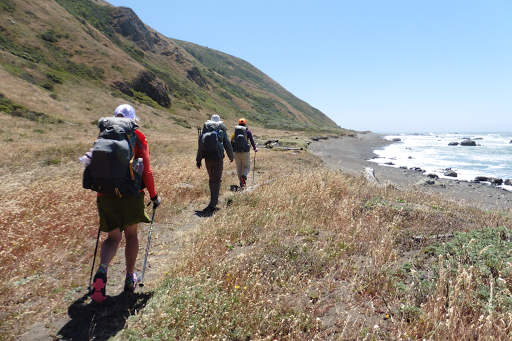 Here is everyone at the northern start of the LCT at Mattole Beach…LoveNote, Kathleen, me, Dan, Rockin, and Drop-N-Roll. THANK YOU to Kathleen for taking so much of her time to shuttle us. It was a great way to start this trail! It was really windy the first couple of hours and then it died down quite a bit. Temps and weather are perfect. Looks to be a dry and warm trip. There really isn’t much unique to say about the LCT itself that isn’t obvious. 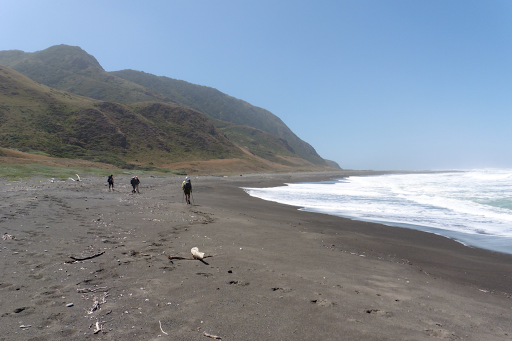 We did the first 16mi and it was fairly equally split between sand, rocky hiking, and dirt paths just above the beach. 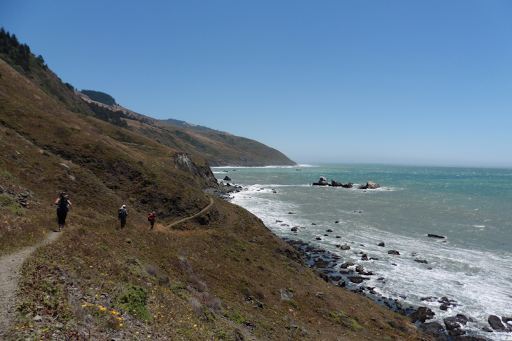 Being in this fresh ocean air is really wonderful and I’m always happy hiking as the waves roll in. There is little variation, but it’s quite peaceful and relaxing much of the time. Most people take twice as long as the three days we have planned to do the whole thing. 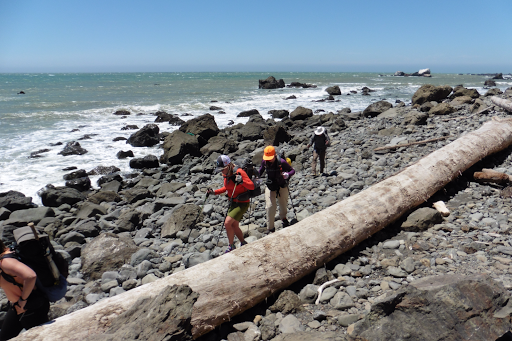 The deep sand and rock hopping took some time, but wasn’t nearly as slow going as we had been warned and anticipated. We know our pace isn’t normal for most LCTers, so be aware of the slow miles if you are planning a trip on the LCT. There were many sea lions (or seals? We couldn’t decide) along the way. 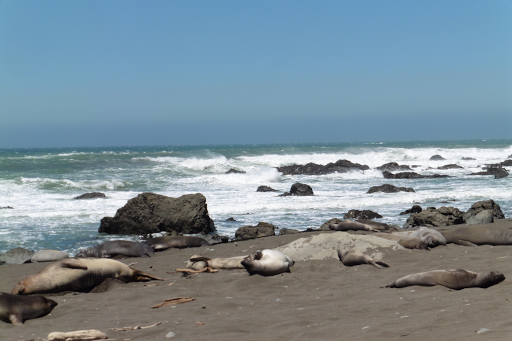 This group was just basking in the sun and napping. It was great to be with this group again. A little tiring to be around so many people, but really nice to be around these guys that are my hiker family. We hiked from abiut 11am-7pm and did 16.6mi. We are all good and tired that’s for sure from the drives the last two days and less sleep than usual. We are camped at Miller Flat, and it’s a Saturday, so there are plenty of other groups around. 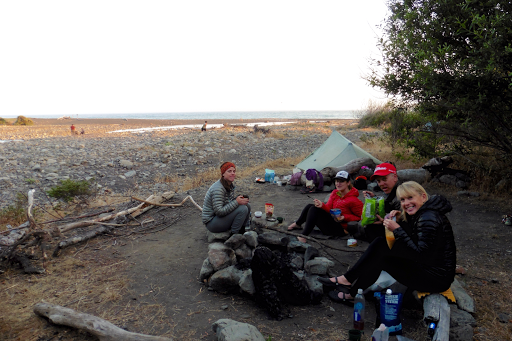 We are camped near a stream a bit off the ocean and it’s nice and protected. There are lots of other groups camped here, but the camp spots are spread out enough that we don’t see or hear them much. It is late and sleep inducing to have this ocean air and waves crashing outside. I keep dozing off as I write! I’ll keep this one short for now and will probably write more tomorrow. Man, I’m gonna sleep great!